On Thursday, Beaumont Children’s Hospital in Royal Oak announced it was the first in Michigan to establish a Pediatric Stereo-Electroencephalography (SEEG) Epilepsy Surgery Program. The ROSA software enables the neurosurgeon and epileptologist to plan electrode placement in the brain before heading to surgery. SEEG as an approach for epilepsy surgery in the U.S. started 10 years ago and was slowly implemented within the past five years. It has successfully been used in Europe for more than 50 years. 3-D image-guidance software enables a robotic arm to place EEG depth electrodes to specific areas of the brain within 1mm of accuracy. 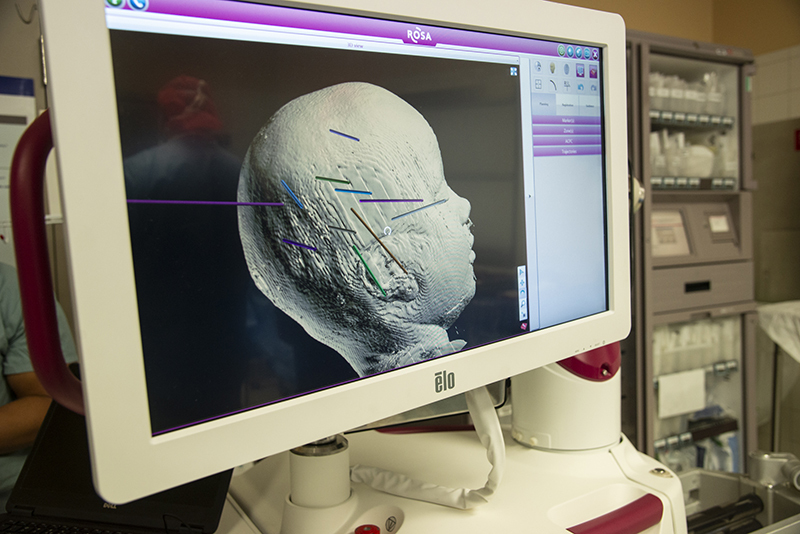 ROSA, a diagnostic tool, uses laser-based, skull bone, and facial recognition software and provides real-time brain mapping in the operating room. Surgeons can then quickly and safely place the depth electrodes, which help establish where the seizure activity comes from. Results from the SEEG with ROSA help determine what part of the brain is responsible for the seizures and can identify tissue that needs to be removed or resected. Compared to traditional U.S. epilepsy surgery programs, SEEG has a much higher success rate. SEEG’s goal is to significantly reduce or eliminate seizures. Epilepsy is one of the most common neurological disorders. The Center for Disease Control and Prevention reports that nearly 500,000 children in the U.S. and nearly 14,000 in Michigan have epilepsy. About one-third have drug-resistant epilepsy. Beaumont Children’s is also the first pediatric epilepsy surgery program in Michigan to offer two innovative and less invasive technologies that can replace traditional surgery from some patients to cure their epilepsy: laser thermal ablation, or Visualase, and responsive neurostimulation. The ROSA and Visualase systems were made possible through a gift from The Carls Foundation. Before coming to Beaumont, Laoprasert worked at the Children’s Hospital Colorado for 16 years, where he served as director of pediatric epilepsy and the pediatric epilepsy surgery program. Beaumont Children’s achieved level 4 accreditation with the National Association of Epilepsy Centers in 2014. Level 4 centers offer a complete evaluation for epilepsy surgery, including electrode placement and a broad range of surgical procedures for epilepsy. Beaumont Children’s is one of five pediatric level 4 centers in the state. Beaumont Health is headquartered in Southfield.